The Headline: Learn about Vocal Point, Battleship and more in the premiere of Scroll’s new weekly podcast! 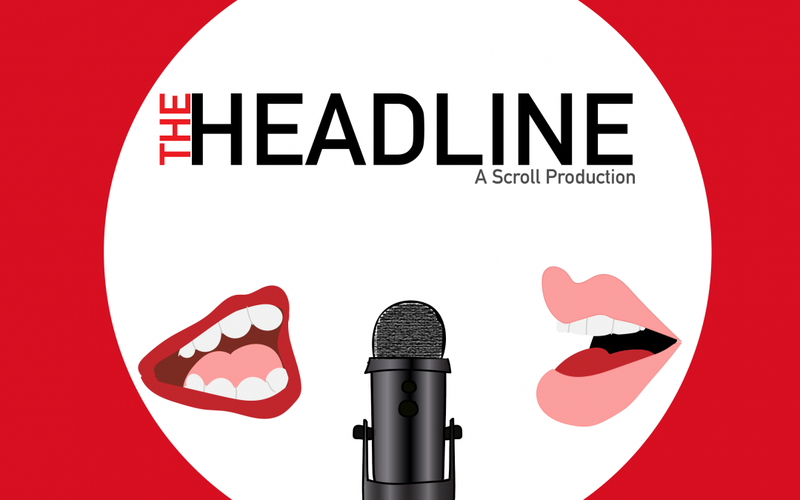 The Headline is a new weekly podcast published by Scroll that covers the hot topics, events, and students on campus. This show is hosted by Rudy Diaz and Travis Hughes and the interviews primarily come from BYU-I students and faculty. This week we will be discussing Vocal Point at BYU-Idaho and Battleship. For additional information on the topics talked about in the show, check out our show notes at the bottom. Rudy Diaz: [00:00:00] What’s up everybody. My name is Rudy Diaz, the host, accompanied by the one and only Travis Hughes. Travis Hughes: [00:00:07] Here reporting for duty. Rudy Diaz: [00:00:08] Awesome. And we’re here together reporting for Scroll’s The Headline. This is a brand new show brought to you by us two. But before we go on let’s talk a little bit about ourselves. First, myself. So yes, I am Rudy Diaz. Yes, I am from the great state of Oregon. I’m also on my final year or semester here at BYU-I. Travis Hughes: [00:00:31] I’m Travis Hughes. I am from the great state of Tennessee. And no, I’m not the only 10 you see. I’m also on my final semester here at BYU-Idaho. We’ll both be graduating in April which is pretty exciting Rudy. Rudy Diaz: [00:00:46] And it still feels surreal to me. So with this podcast, The Headline, we wanted to give a voice to the activities that are on campus, the hot stuff, and how the students are really digging these activities. Such things that we talk about, you can find on the Master Calendar. Travis Hughes: [00:01:05] Yet our whole point doing this is to cover and give you the big events going on at BYU-Idaho, but also give voice to you the students and allow you to talk to us and hear your voice heard through the BYU-Idaho Scroll. Rudy Diaz: [00:01:20] Yes, and so The Headline will be published every Wednesday so that you guys can get that hump day recovery with the podcast. Kind of give you guys something to look forward to as well, because although we all be slipping on that ice outside at times there are some other things to look forward to. To kick off the show this week. Rudy Diaz: [00:01:39] Samantha Vanderwalker from the Scroll published an article titled Finding Spirituality in Music. This piece, which is on the Scroll website, was fantastic as it covered the story of Austen Roylance, a junior studying music, and his junior piano recital. This recital is a requirement for his degree, but the story dives into the spirituality of music for Roylance. Here is a preview of that recital. Rudy Diaz: [00:02:46] To read more on Roylance and his journey or to look at the multiple fabulous pictures or to listen to more of the recital, be sure to check out the article on the Scroll website or click on the link and the description. Awesome. Now onto the next topic, Vocal Point. Travis Hughes: [00:03:02] Yes. BYU Vocal Point is coming to perform for us at centre stage this Friday Jan. 25 7:30 p.m. in the Hart Auditorium. Information for anyone (who may not know) you can get floor seats for $6 if you’re a student; $12 to the general public. If you get bleacher seats it will be $5 for students and $10 to the general public. I personally go for those floor seats because if you’re sitting there for more than an hour you get pretty uncomfortable. Rudy Diaz: [00:03:29] Yeah, and you definitely want to try and enjoy this to the best that you can. If there’s anything I can recall about Vocal Point, it is a fact that they definitely play a huge part in so many missions. Oh my goodness. At least to my mission alone in Uruguay Montevideo. There were many people who love Vocal Point especially their version of the song Nearer my God to Thee. I can dig it at times, but there were others that were more passionate about it and for those of you that listened to them on the mission field, this is definitely your chance to see the group. Travis Hughes: [00:04:00] Yes I recall it too except I didn’t serve in Uruguay, I served right here in the great state of Idaho in Boise for my mission. And yes everyone listened to Vocal Point and I mean I personally really, really liked these guys. I think a cappella is a great way to do music and I’ve really enjoyed listening to them personally. Here’s one of you students who also enjoy Vocal Point. Her name is Victoria Jackman, a junior majoring in marriage and family studies. Do you listen to Vocal Point on your mission. Victoria Jackman: [00:04:36] Yeah, I loved them. I just found the music really uplifting and inspiring, and it was really fun to listen too. Travis Hughes: [00:04:43] I have to agree with Victoria. That was one of the big things for me. It was a great sound it kind of gave me. It wasn’t Mormon Tabernacle Choir, it was a very new sound, but it was very inspiring and very uplifting and I personally really enjoyed their style of music. Rudy Diaz: [00:05:00] Definitely! I think one of the interesting things is that, at least in my mission, there were moments where people were wondering “The Mormon Tabernacle Choir is fantastic, or I guess the Tabernacle now, but there was always that sense of variety that was wanted and needed and stuff like that. So Vocal Point definitely offered that for several students. And with that said! Be sure to go to the website and get your tickets as soon as possible. They are flying away like hotcakes so be sure if you’re really interested to check that out now. Travis Hughes: [00:05:34] Now Rudy, do hotcakes fly? Rudy Diaz: [00:05:36] Isn’t that the phrase? Travis Hughes: [00:05:38] Selling like hotcakes I think is the phrase, but they might fly actually. I will double check on that. Rudy Diaz: [00:05:45] You know, I try my best. Travis Hughes: [00:05:47] Rudy and I are friends by the way, we’re good friends. We’re not getting mad at each other or anything. We’re just teasing. Rudy Diaz: [00:05:53] Never. So, I do appreciate their time here, but wouldn’t it be cool to have somebody like Gladys Knight? Travis Hughes: [00:06:04] Isn’t she performing at the Super Bowl this year? She’s doing the national anthem. Travis Hughes: [00:06:10] I’d love to see her here. Rudy Diaz: [00:06:11] Yeah. She’s also a member of the Church; very devout. Fun fact, Gladys Knight spoke at a 1999 Women’s Conference by the way. So BYU-I, if you’re listening to the podcast just giving a shout out to Gladys Knight. With that said, let’s move on to round 2 topics, and that is the glorious Battleship. Travis Hughes: [00:06:40] Yes, not the board game you know where you call out numbers hit or miss, or if you’re like me playing the electronic version where you got airplanes or things like that. No! We are not playing that game. Rudy Diaz: [00:06:55] Yes, so battleship is actually gonna involve getting into a canoe. What! A canoe? Yes. So the objective of this one is that everybody, roommates, are invited to participate in the battleship tournament that will be on Saturday Jan. 26 from 8 to 2 p.m. in the Hart swimming pool. 8 in the morning to 2 p.m. Yes. Please don’t go at 8 at night. You would have missed the event by then. But this is an interesting opportunity because it doesn’t allow just for roommates to bond with each other. But it also allows roommates to fight for a glorious prize. Travis Hughes: [00:07:36] That prize is… Drum roll please! A semester’s supply of toilet paper. Rudy Diaz: [00:07:46] Exactly. Have you guys ever complained or fought about who is going to have to buy TP next? Well once you guys participate and if you guys manage to win the battleship tournament you guys will have the opportunity to get some TP, unlimited, for this semester. Not for life, for the semester! Travis Hughes: [00:08:05] All right. That’d be nice. I’m married but I might need to get my wife if my wife and I can join a team. Get that TP for life. Rudy Diaz: [00:08:16] That be cheating because you guys aren’t… sorry. The single life, gotta live it. But yes. So with that, we also have some comments from Alejandro Lopez regarding this activity. So let’s give him a quick listen. Alejandro Lopez: [00:08:35] Having to live with roommates and getting to know them makes events like this worth it. Where you can get a group of close friends and rock everybody else and prove it you’re really the best in the complex. I mean actually in the university. I always liked that the schools coming up with new and creative ways to get the students involved. I’ve always loved the game Battleship as a kid and now to be able to actually kind of play it with a kind of sort of similar premise. Way cool. Good job BYU-I. Travis Hughes: [00:09:00] For those of you who don’t know how this Battleship tournament is run, it’s basically roommates will have the opportunity to get into a canoe. They have buckets and they take water and they chuck it at anyone else in other canoes. The goal is to knock and to sink the other people’s canoe. So you’re legitimately playing a real-life Battleship where you are in the Hart swimming pool and trying to sink the boats around you. Rudy Diaz: [00:09:31] Yes, there are some things to keep in mind though. When you guys do participate, you guys will need to watch out and make sure you guys have BYU-Idaho approved clothing. To find out more about BYU-I approved swim gear, be sure to click on the link below in the description for more info. So you guys will not have to bring your own canoe fortunately. So that will be provided. Travis Hughes: [00:09:55] Fortunately, cause I don’t own a canoe. Not that I would be participating, but I don’t know of anyone that owns a canoe here at BYU-Idaho. Please be sure to check on the rules because if you don’t know the rules you can’t win that toilet paper. Rudy Diaz: [00:10:09] Exactly. And a rule that’s really important. It states specifically you may not touch other players in another canoe. So this is not an all-out brawl. Trust me, I thought it was for a moment, but use your buckets to sink the other ships. Travis Hughes: [00:10:28] That sounds like a lot of fun to me if I was still if I was not married and if I had roommates, I think this is something that I’d definitely be wanting to do. Rudy Diaz: [00:10:37] Be on the lookout. That’s happening this Saturday, so don’t miss your opportunity for that and especially TP. I cannot stress this enough. I was not really thinking going, but just because there’s TP I am kind of tempted now. For additional information and to register for this activity with your apartment or roommates, be sure to call (208) 496-9220 for all the details. So with that said, thank you guys so much. Please ask us questions. Travis Hughes: [00:11:14] If you want to know anything about us, or who we are, or what the Scroll does, just ask. Ask us goofy questions about Rudy and I. We want to hear your feedback to us. And who knows. Hopefully we can get you guys questions and comments onto the podcast for next week’s episode. Rudy Diaz: [00:11:33] Exactly. We would love to respond to those. I’ll answer one question right off the bat. If anybody ask if any of us are single. Travis is married — like he stated once — and I am single. Interesting fact for anybody who has wondered. For some reason that’s a popular question at BYU-I. Travis Hughes: [00:11:50] Oh, okay then. Rudy Diaz: [00:11:54] So with that said, thank you guys so much for listening and feel free to comment. And with that till next Wednesday, this was The Headline. Here is the link to Finding Spirituality in Music.